In 2009, Panos founded "The Business Video" company, a medium sized video production company. 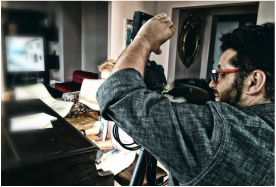 Working in front of and behind the cameras, targeting exclusively towards the business and mainly the touristic sector, Panos deals with the challenge of creating promotional and corporate films, appropriate for driving forward the object of businesses, through the use of the “traditional media”, the Internet and the online tools (Social Media). He has cooperated with both domestic and international well-known companies, such as Turkish Airlines, UNESCO, Visit Greece (EOT), TEDx Athens/Thessaloniki and more. Today, he can be found in New York, United States, where he works as a Film Director and Cinematographer for Antenna Satellite as well as a Radio Host and Program Director at one of the most popular radio stations in New York, Hellenic Public Radio COSMOS FM 91.5.